Well the gentling process for all the wild horses in our care is progressing very well. 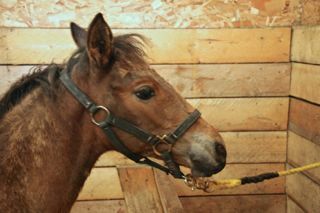 A decision was made to wean little Sunset, the filly, early from her mare. The old girl, Angel, even though she was getting lots of excellent hay and had a high protein molasses tub in her pen, was not getting her body condition back very well at all. 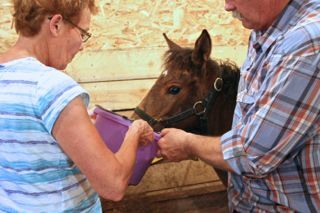 We hope that by removing the drain of having to nurse the foal, she can pick up more quickly and put more weight. Sunset is losing her baby coat and once she was haltered and tied in her box stall, she certainly enjoyed the brushing along her back and hips to remove more of the hair. This is also gives assurance to her that everything is okay. Sunset settled into her box stall very well where she is out of the bugs and the hot sun. We had quite a few of our members around and she is learning quickly to get use to all the different people and sounds. She loves her hay too and did not hesitate to start munching away while tied. Here she is being introduced to her first bucket of milk replacer. This is still very important to assure that she gets the proper nutrition she needs. Still a little shy about it, the bucket had to be held up to her muzzle. In a short time and as she gets to like the taste she will start to drink it all up. This is the story of the mare. Last September we were back to close to Lost Lake which is north of Williams Creek. 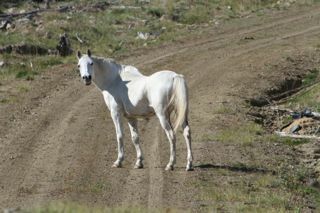 Then as we came over a hill we noticed a lone white horse wandering down a logging road. As we got closer we could see that it was a mare and that she was alone with no other horses close by at all. We thought that she may not be a wild one and we also felt that the odds seemed stacked against her being able to survive. So we tried to approach her, getting to within 8-10 feet before she moved away slowly. We tried several times to get close enough to get a rope on her but that would not happen. Finally she wandered off, but we knew we had to come back and try to find her. We did make several trips back there throughout the fall without success. Late December we saw her close to main forestry road but still inside the forestry. the snow in this area was extremely deep and survival for even a healthy horse had become a struggle. Even though she had lost a lot of weight she had survived, although she had become very elusive. Then in late April we noticed that she had given birth to a foal and was still in this small area. Here she had lots of protection in the trees, she could find feed and she was also probably safe from any predators since it was so close to the main road. 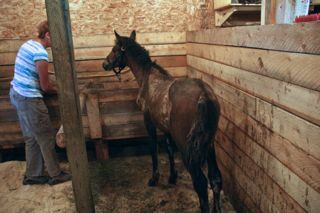 She was doing okay even though her body condition had deteriorated quite drastically due to giving birth to the foal and the overall struggle to survie such a harsh winter that claimed many other wild horses. All things seemed okay until it was noticed in May that she was now on private ranch land next to the area where she had lived all winter. The reason she got onto this land was that some fool had cut the ranch fences thinking that this would help her. We worried about her and her foal for many reasons, including the fact that two young grizzly bears had moved into the same area. Then in June, WHOAS received a phone call from the ranch asking if we wanted to purchase her due to the fact that they could not keep her after bringing her into their corrals. This is what we did and she was then brought into our temporary facility at Dan’s and Karen’s ranch to join a couple of the other wildies we had rescued. 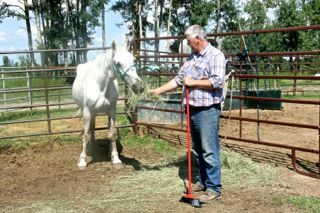 Since then she has received lots of hay and received minimal gentling as we wanted the mare to get into better condition and also to allow the foal to grow. This initial gentling process was just touching her and being around her. Then as mentioned it was decided more had to be done to help the old girl out, thus the foal was removed from her. At the same time that this had to take place, Dan and the boys managed to get a halter on her. At first she did not like being restrained at all. But as the day progressed, she started to yield to the pressure of rope and halter. As we watched, we felt so sorry for her as she was trembling with fear, but what we were doing was so necessary in order to properly care for her. We continued at this point to softly talk to her trying to reassure her that we meant no harm. The soft approach and voice began to calm her. Here she has calmed down and started to take hay from Dan’s hand. WHOAS hopes that we have now given her a chance for a much better life. We believe we have found a forever home for Angel where she can peacefully live out the remainder of her life. 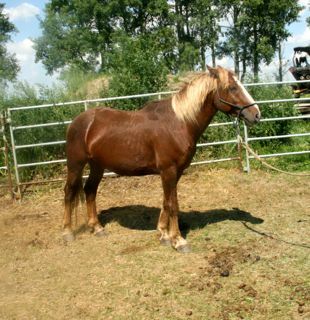 Timber, pictured here, has been gelded and will be shortly moving to his new home. He has come so far in his training and will still require some work which we know he will get with his new owner. 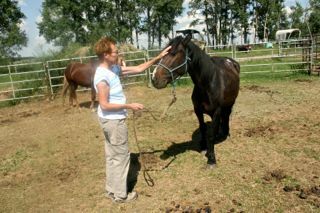 Rex too has been gelded and is leading very well, likes to be brushed and is ready to go to a forever home. He will make an excellent horse as he is intelligent and willing to learn which continually shows through when handled. We hope to find him a home quite quickly now as we believe he is ready. WHOAS only charges a $300 adoption fee to help cover the costs of board, feed, vet bills as well as initial training. These older horses do take a lot longer to gentle than the younger ones we have worked with in the past. Sunset too will soon need a forever home. 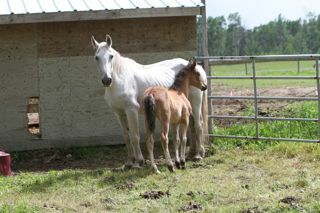 Please contact us if you would like to adopt either of these two beautiful horses.